Just as another year of annual reporting ends, another monitoring season is about to begin and our minds start to wonder about the coming season. Like clockwork, fresh in on the northerly and easterly winds comes the much awaited return of our wintering birds. It’s an exciting time of year with news of wildfowl arrivals coming more and more frequently as they reach our shores. Right on time, the Canadian Light-bellied Brent Geese arrived at WWT Castle Espie, County Down, during the first week of September, with numbers at Strangford Lough building to 14,000 birds by the 12 September. A small flock of five Pink-footed Geese arrived at WWT Martin Mere, Lancashire, on 10 September and not far behind, Jeremy Squire recorded the first arrivals at Loch Leven in Perth and Kinross on the 15th. Numbers soon started to rise at both sites, with Jack Grimsditch recording 21,100 at Martin Mere on 2 October. 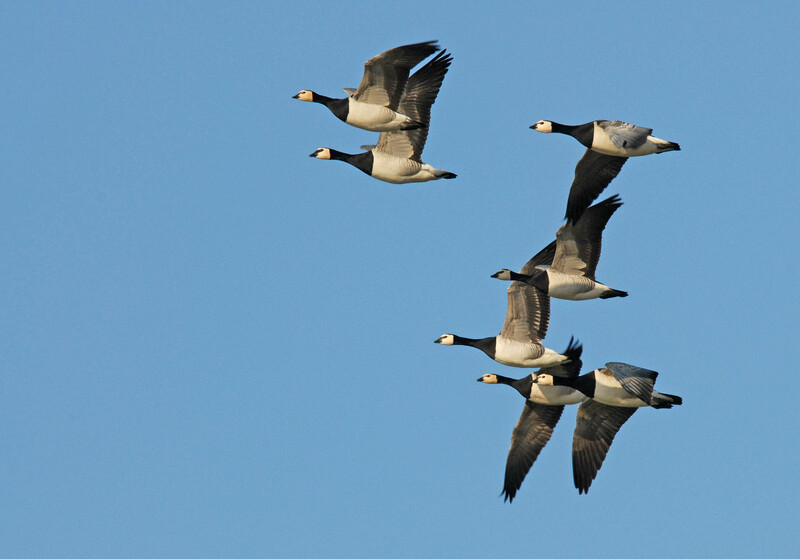 David Parnaby and Ciaran Hatsell at Fair Isle Bird Observatory reported good numbers of Svalbard Barnacle Geese passing over the Shetland isle on 4 October. Some geese did choose to land on Fair Isle, and David and Ciaran counted 1,275 birds, a record count for the island. The duo also spotted an impressive 23 colour-ringed geese amongst the flock. Further south on the Solway Firth, WWT Caerlaverock welcomed the first wintering geese on 20 September when 33 Barnacle Geese arrived with numbers reaching 15,980 on 7 October. In Iceland, as the dark nights started to draw in and the temperatures dropped, the Whooper Swans got their cue to begin their migration. Their arrival to Britain was documented, with reports of small flocks being seen in Lancashire and Dumfries-shire during the last week of September. Looking eastwards, thanks to tracking devices fitted to Bewick’s Swans as part of WWT’s research and the Flight of the Swans project, we know that the Bewick’s have started their migration from the Russian tundra, with the first reaching the Baltic States by the first week of October. All these arivals also make us wonder what the next set of GSMP results will bring. Will the Pinkfeet have yet another successful year and the population continue to rise even further? How will the Dark-bellied Brent Geese fare after their poor breeding year in 2015? We won’t know until next year when all the counts are in, however, in the meantime, if you use Twitter, do let us know how your GSMP season is progressing by using the hashtag #_GSMP. We hope all GSMP counters enjoy another season of monitoring, which begins with the first coordinated Icelandic-breeding Goose Census count this coming weekend.